Now, while Christmas pudding is much loved – it can be a bit like Marmite; a lot of people just hate it. Personally, there is nothing I like better than a bit of Christmas pudding covered in double cream. So GOOD! But you know me – I’m not one to be judgemental. Everyone should enjoy Christmas day and the delicious treats it brings with it. For you non-Christmas pudding lovers – here is dessert #2 of our altenative Christmas Pudding inspiration. 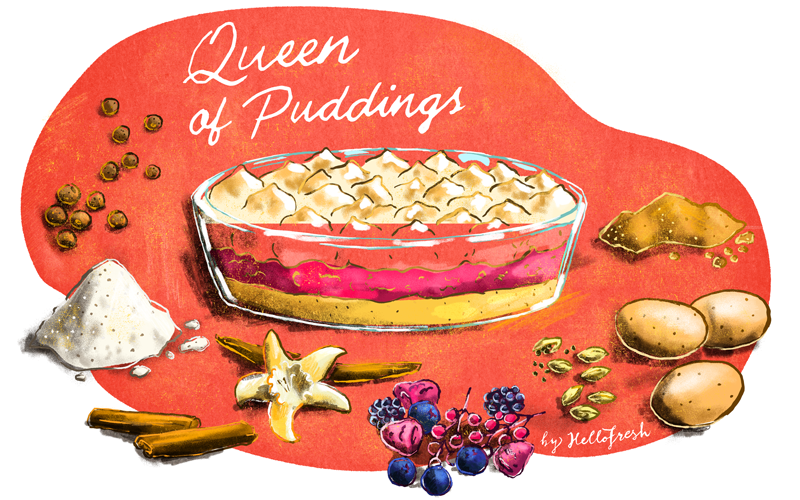 The Queen of Puddings is beyond delicious. The lovely Mimi from our recipe team got pretty excited when I told her this was going up on the blog exclaiming “That’s my favourite dessert!”. Well Mimi – this one’s for you! Preheat the oven to 150ºC. Separate 3 of the eggs. Pour one whole egg and the yolks of the 3 eggs in a bowl and beat together. Now add the breadcrumbs, the scraped out inside of the vanilla pod and the milk. Finally add 100g of caster sugar. In a over-proof dish, add the jam to the bottom and spread out thoroughly. Pour the egg mixture on top of the jam and bake in the over for 1 hour. Take your remaining egg whites and beat until white and stiff. Now add the rest of your sugar and mix in carefully. Take the dish out of the oven and add the egg whites to the top and bake for 20 minutes.